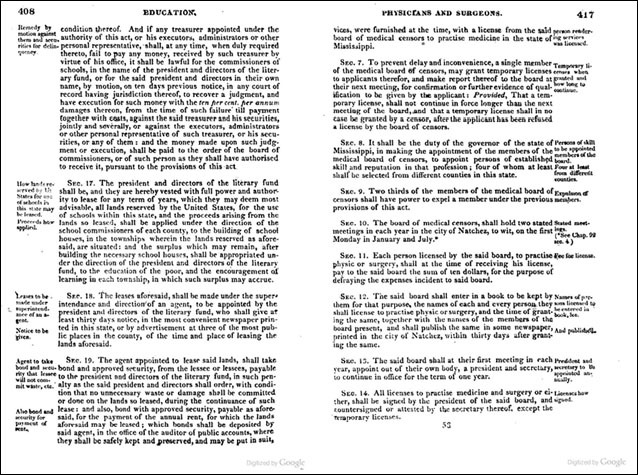 There’s a really interesting statute that was passed by the Mississippi legislature in 1819, dealing with the licensing of physicians and surgeons. And it’d be really neat to read that “An act, to regulate the admission of physicians and surgeons to the practice of medicine and surgery in the state of Mississippi,” passed the twelfth day of February, 1819, wouldn’t it? The digitized version of this particular volume, digitized by Harvard University and online at Google Books, doesn’t include pages 409-417, containing all or parts of chapters 80-91 of The Revised Code of the Laws of Mississippi… 1823. Including, if the index to the volume is correct, the section we’d like to read with that 1819 act. Oh, you can look at HathiTrust, if you’d like, and you can look an Internet Archive as well. There’s no alternative version of this book on either of those digitized services either. Now there’s no doubt there are print versions of the 1819 act in law libraries all across the United States. But if you’re looking for that one statute, sitting at home at 3 a.m. in your bunny slippers, the fact that it’s only been digitized once, by one library, and is online from one service, means the answer is not going to be found. It’s simply Not All Online. Not when it comes to records. Not even when it comes to the laws. Such grand timing!! I have researched a doctor in MS for six months trying to find out where he went to school so it could be added to his tree information, NO LUCK…then I came across a document of 1870 of MS that listed each doctor by county! BINGO..except he was one of about five that no education was printed. But, he was a physician in all the census documents from around 1840 to 1870. In the listing there is a footnote that individuals who has practiced medicine without educational training and were in good standing in the community and accepted as physicians were allowed to continue to practice without credentials. I would be happy to share this document with you and the example if you would like to add it to your file. By hook or crook we finally come to some “gems” once in awhile. I’d love to see it, Barbara, and thanks! I agree with you, Judy, that not everything is online. But a few small observations. First, this book was not “digitized by Harvard University and online at Google Books.” As the scan clearly states in the corner, the book is from the collections of the Harvard University Library but was digitized by Google. Second, most of the books found in HathiTrust are also Google scans, so it is not surprising that the scans in Google and Hathi have the same defect. The neat thing about Hathi is that you can report problems on a page using the “Feedback” link at the top of the Hathi page, and it will try to fix the problem. I have gone ahead and reported that these pages are missing. Internet Archive is a good place to look as well since many of its scans come from sources other than the Google Books project. DPLA is also a place to check, but since most of the books in its collection come from HathiTrust, the odds are not high that you will find a separate scan. In this case, the place you need to turn is HeinOnline. It has the volume available in full. You can visit a law library that subscribes to the database or pay to have short-term access to the online file. So while not everything is online, there is a lot more online than one might think by just using Google books. I actually have found different scans in each of the three digitized book services (Google Books, HathiTrust and Internet Archive) on occasion, so it’s always worth checking all three just in case. As far as optionsm, yes, Hein Online is a wonderful option if you’re in a jam and must have access immediately, but it’s not cheap: it’s $29.95 for 24 hours, and you can only download five PDF files during that time period. What is missing is a signature of the book. Could it have been put in the wrong spot when (if!!) the book was rebound? I have seen this occur in other books (such as a WV estate-records book). It may seem rather above-and-beyond, but try browsing every 16th page to see if the signature may just have bound out of order.